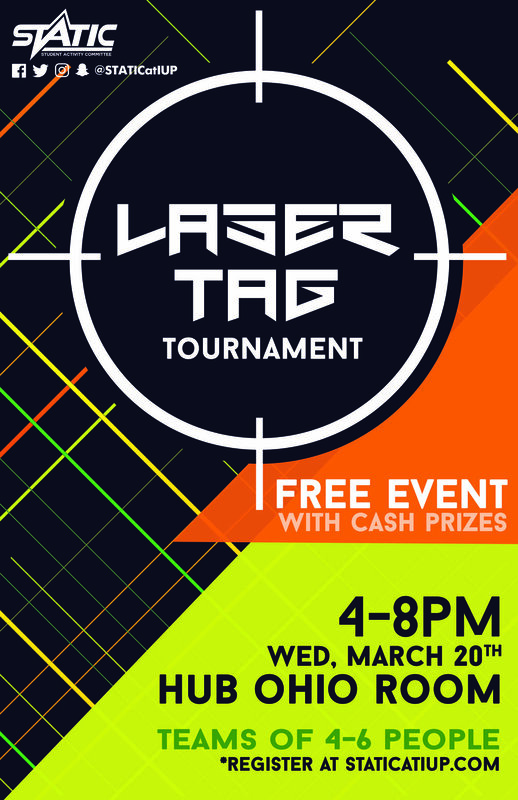 In celebration of St. Patrick's Day and #IUPLeads at IUP, STATIC is sponsoring its annual Laser Tag Tournament on Wednesday, March 20, from 4:00 to 8:00 p.m. in the HUB Ohio Room. This is a REGISTRATION ONLY event, so please sign-up prior to the event. Two teams of four to six people can compete every 20 minutes for cash prizes. Students interested in competing in the tournament can register here. Admission is free, and is open to the entire IUP campus community. Although participants should preregister online, registration will also be available at the event.